One of the most exclusive Beach Resort in El Salvador. Surrounded by a private and natural environment that provides you a stay full of tranquility with spectacular views to the Pacific Ocean. 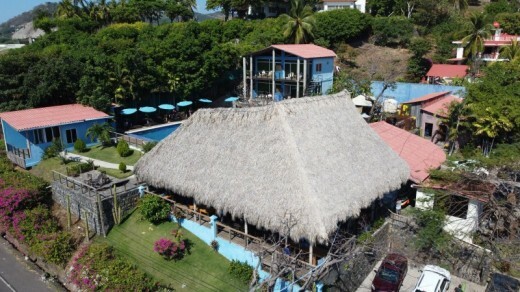 Located in front of one of the best Surf breaks of El Salvador, El Sunzal. Kayu Resort is a perfect destination to rest, relax and get away from the stress. The Resort has 7 rooms in total, 5 Executive Suite and 2 Small rooms. Also has a nice pool and Jacuzzi, Restaurant Service, Free WiFi, Private parking, Beach access through our Bar. * Kayu Resort reserves the right to refuse admission. * The Hotel facilities are exclusive to guests. Visitors are not allowed to use the facilities without the prior authorization of the hotel management. * Our rooms are Non-Smoking. Smoking is permitted outside the rooms and open areas. A $100.00 Cleaning Fee will be charged if we find signs of smoking in the room. * Is strictly forbidden use Drugs in the Hotel facilities. * The keys must be returned at Check-Out. In case of loss of the key, the guest will pay a fine of $25.00. * Is not allowed the entry of food and drinks to the Resort facilities by the guests. * The Resort has a Bar and Restaurant that will provide all the needs. Por favor, rellena el formulario con tus datos de contacto. Introduce un email válido ya que lo vamos a utilizar para enviar el bono de la reserva.